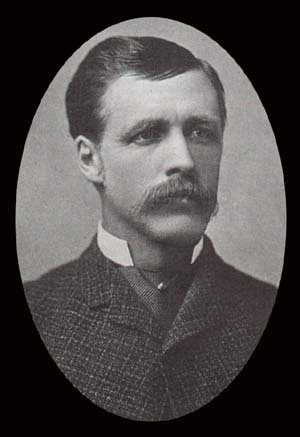 Portrait of William Henry Jackson. Born in Keeseville, New York, on April 4, 1843, William Henry Jackson was a self-taught artist who, at the age of 15, was working as a retoucher in a photographer's studio. He was successful in this pursuit and later moved to a more prosperous studio in Rutland, Vermont. He honed his artist's skills with the retouching work, but also learned a great deal about the young art of photography, a skill that would stand him in good stead later in life. In 1860, with the onset of the Civil War, Jackson enlisted in the Union Army. His unit spent most of its time on garrison duty. Though present at the battle of Gettysburg, he was stationed in the rear areas guarding supply trains and saw no action. Mustered out in 1863, he returned to Vermont where he went to work in Style's Photographic Gallery in Burlington. In the spring of 1866, Jackson, despondent after a broken engagement, decided to follow Horace Greeley's advice and go west. In Nebraska City, Nebraska Territory, he was hired to work as a bullwhacker for a freighting outfit bound for the gold fields of Montana. Along the old Oregon Trail, Jackson sketched the landmarks and lifestyles that have become a large part of the American experience. After his return from the west, Jackson opened a photographic studio in Omaha, Nebraska. During the summer of 1869, Jackson began photographing the construction along the new Union Pacific Railroad. His work came to the attention of Ferdinand Hayden who was organizing a geologic survey to explore the mysterious lands known as Yellowstone, and he was asked to accompany the expedition. 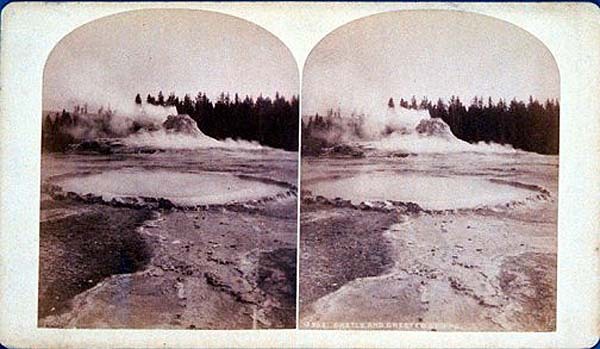 As a result, William Henry Jackson became one of the first photographers to successfully capture the wonders of Yellowstone on film. 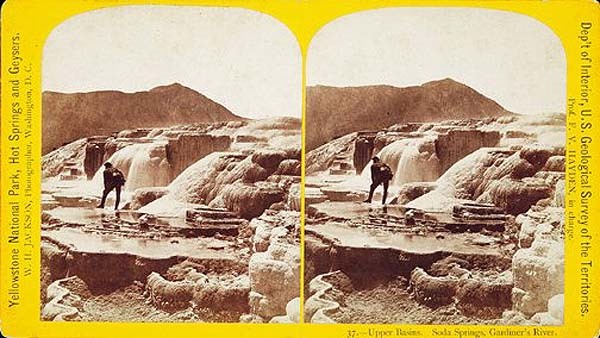 Jackson's photographs were an important factor in convincing Congress to establish Yellowstone as our first national park in 1872. For the next several years Jackson accompanied other geologic surveys of the west and southwest. In 1879 he decided to open a new studio in Denver, Colorado, where he spent a great deal of time photographing the railroads and the marvels of engineering that made it possible for the trains to make their way through the Rocky Mountains. He also became famous for photographing the Mount of the Holy Cross - a place most people had thought existed only in legend. At a time when most men consider a well-deserved retirement, Jackson developed new interests. In 1894 he set out on a world tour that visited Europe, Africa, India, Australia, Japan, and Russia. He wrote his autobiography, and once again took up the paintbrush in an effort to depict the history of the west that he had experienced firsthand. William Henry Jackson celebrated his 99th birthday in 1942, and died two months later on June 30, 1942. The long life of William Henry Jackson allowed him to witness many changes in American life, and he used his artistic skills to document those changes for succeeding generations. A wing of the visitor center at Scotts Bluff National Monument is dedicated to the life and work of William Henry Jackson, and a large number of his original paintings are a part of the park's collection, where they are used to illustrate a vital part of our history. It is said that Jackson produced over 54,000 negatives in his photographic career. 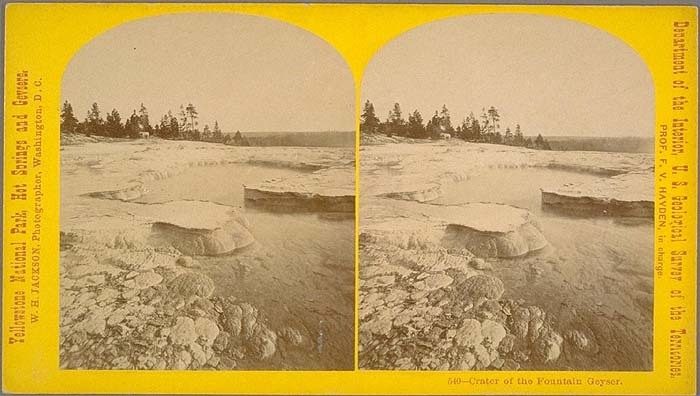 Many of these were issued as stereoviews, and of these many were of Yellowstone. 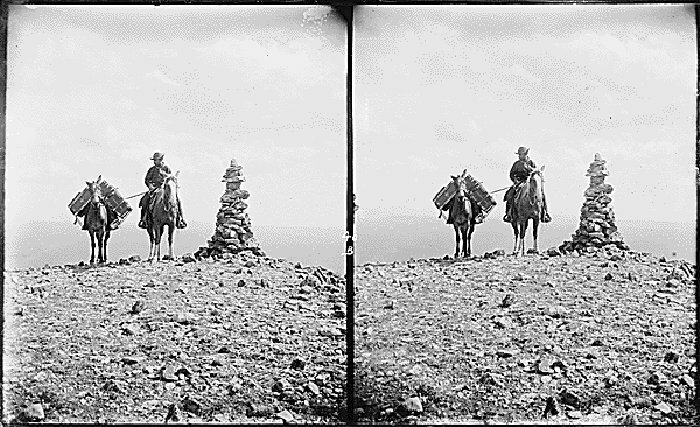 His multitude of Yellowstone view styles make Jackson one of the more complex photographers to analyze. The styles are described below. 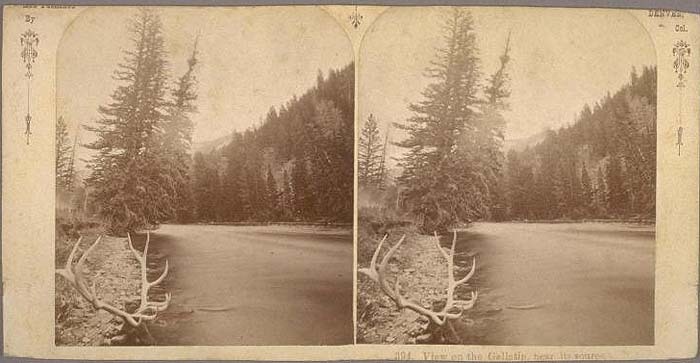 This set is labeled on the right side: "Scenery of the Yellowstone, 1871." The left side is labeled "W. H. Jackson Washington D.C. Photographer to the U.S. Geological Survey." It is numbered from 420-466 and found on Yellow Cabinet Mounts. 460–Crater of Giant Geyser, Fire Hole Basin. A view of Giant Geyser at Upper Geyser Basin. 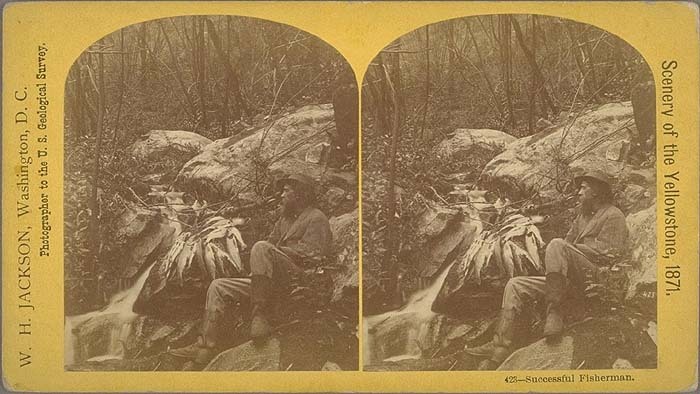 These were among Jackson’s first stereoviews issued. 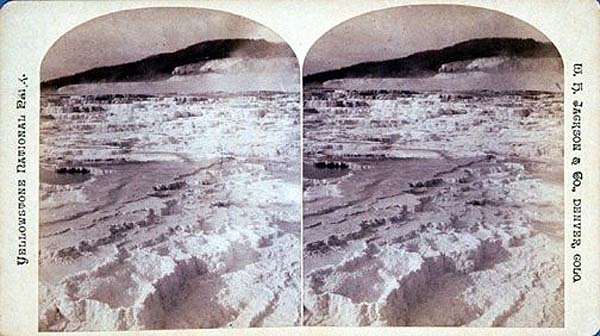 Another of the 1871 stereoviews. This famous fishing scene has been reproduced many times. Another printing perhaps of the above set. This one has the same numbering and is also on Yellow Cabinet Mounts. 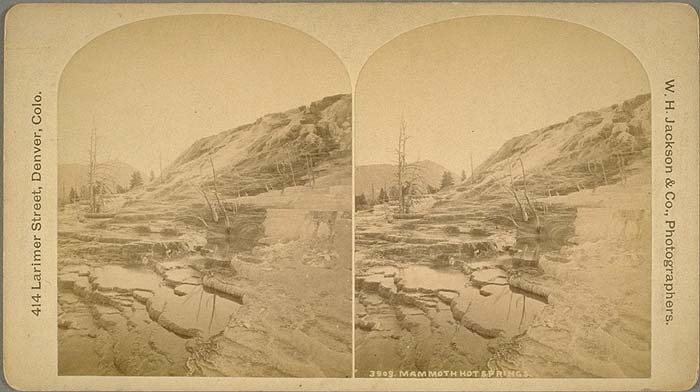 The left side is labeled, "W. H. Jackson Washington D.C." The right side is labeled, "Scenery of the Yellowstone." 430–HOT SPRINGS ON GARDINERS RIVER, LOWER BASINS. A view of the terraces at Mammoth. This view has no date of issue but was part of the 1871 set. This Yellow Cabinet Mount view type must be extremely scarce because I have only seen a couple. The left side is labeled, "The Wonders of the Yellowstone." The right side is Labeled, "W. H. Jackson Photographer to the U.S. Geological Survey." There is no mention of Hayden or Washington D.C. anywhere on the view. This set must be very early (1871, 72). The titles are hand-written on the obverse. There is no numbering on these views. 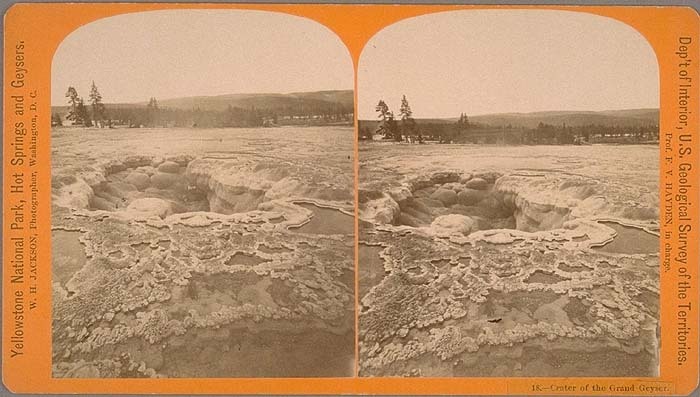 This rare Jackson view may be Soda Butte in the northeast corner of Yellowstone. Stereo, studies among the Rocky Mountains. 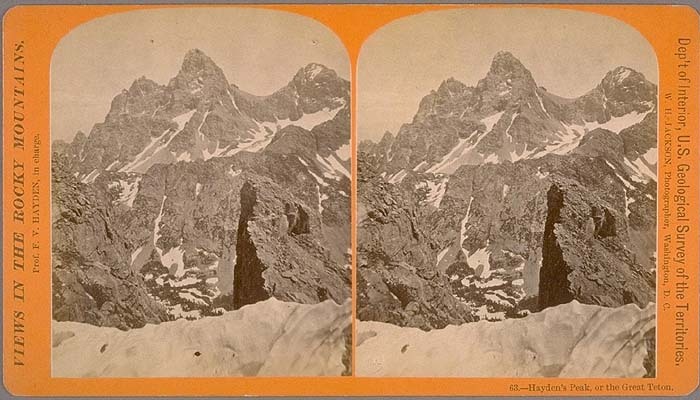 Stereo, studies among the Great Tetons of the Snake River. Views of the West Gallatin, Montana Territory. Yellowstone National Park, Hot Springs and Geysers. Views in the Yellowstone National Park. Yellowstone National Park, Mammoth Hot Springs. 540-Crater of the Fountain Geyser. This view from the set, "Yellowstone National Park, Hot Springs and Geysers" shows the crater of Fountain Geyser at Lower Geyser Basin. 533-Sawtelle's Ranch, Henry's Lake, Interior. 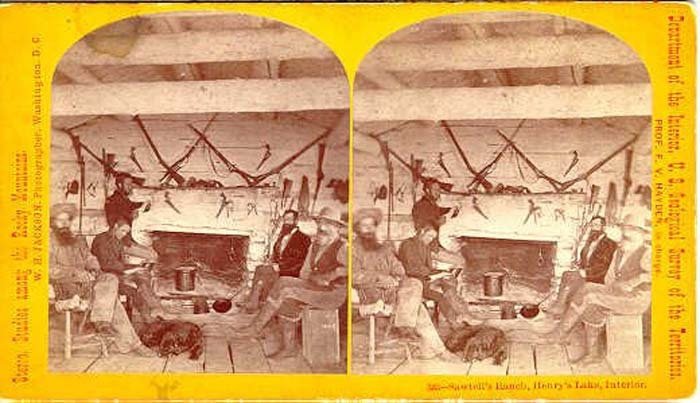 An amazing image showing the interior of Gilman Sawtelle’s cabin at Henry's Lake, Idaho and members of the Hayden Survey. 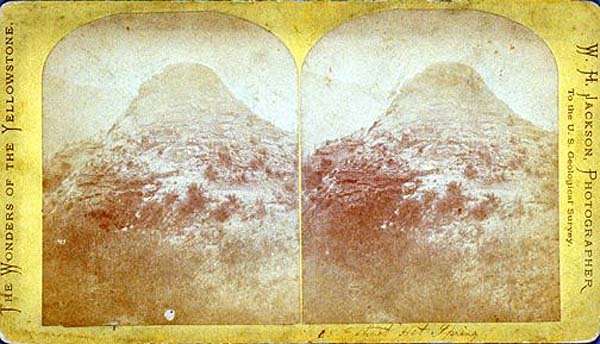 It is part of Jackson’s "Stereo, studies among the Rocky Mountains" set. Jackson’s Teton views are also noteworthy. Here is one showing the high peaks long before they a were part of a national Park. 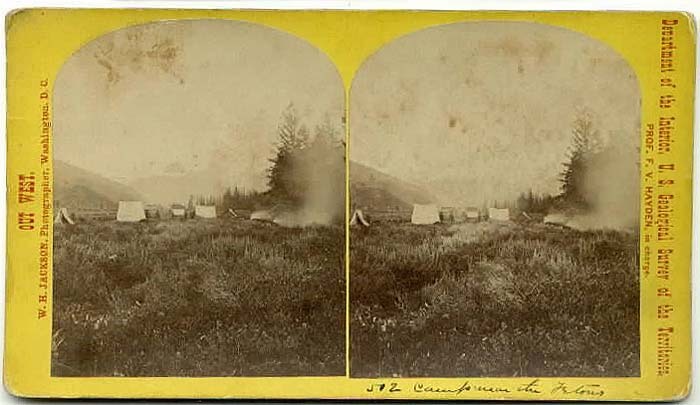 This scene from Jackson’s "Out West" series, shows their camp in the Snake River Valley at the base of the Teton Range. This set is nearly identical to its counterpart below except that it has with black lettering. 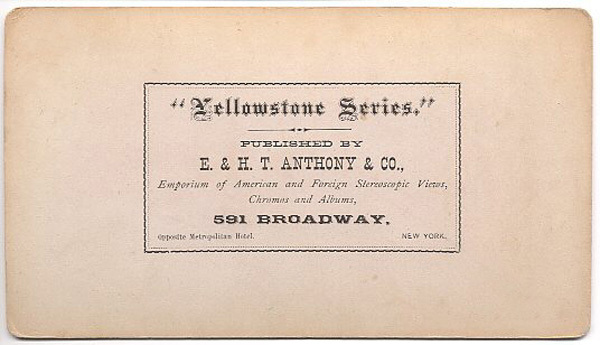 Unlike the other Anthony issue, this one includes views only from Yellowstone. Also, it is numbered from 1 to at least 57 (the other goes as high as 99). 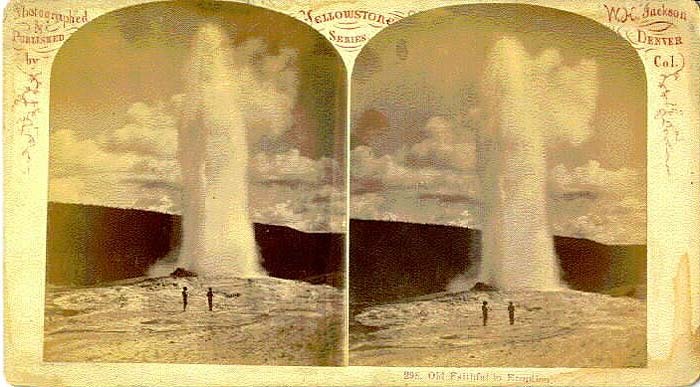 The left side is labeled, "Yellowstone National Park, Hot Springs and Geysers." The right side is labeled, "Dept. of Interior, U.S. Geological Survey of the Territories." These have the elaborate Anthony reverse with artwork and credits. 37.–Upper Basins. Soda Springs, Gardiner's River. 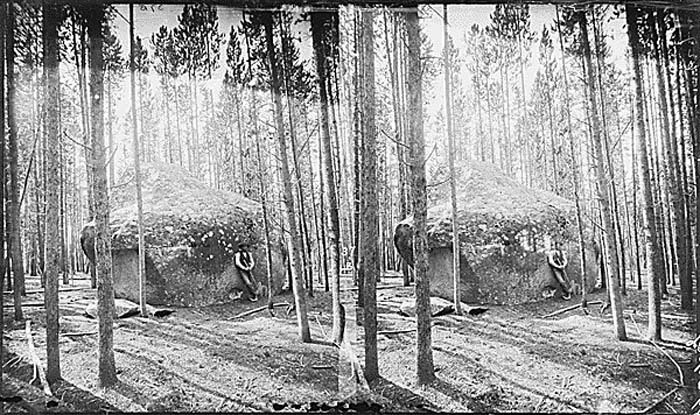 A classic Jackson image showing the Mammoth Terraces. 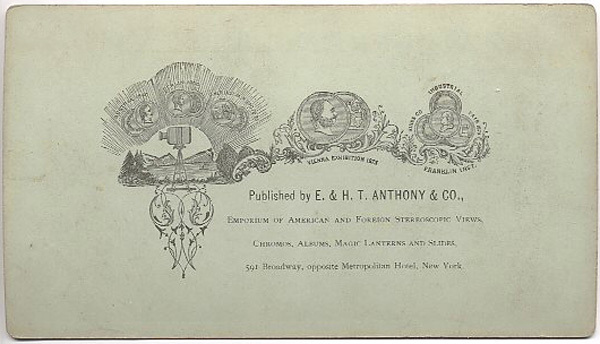 It was issued by E. & H. T. Anthony of New York. This set is numbered #1-99. It is found on Red or Orange Mounts. These views all credit both Jackson and Hayden. Some are untitled, but most have numbered title on obverse. These have the E. & H.T. Anthony stamp inside a rectangle on the reverse. They include views of Yellowstone and the Tetons. 63.–Hayden's Peak, or the Great Teton. 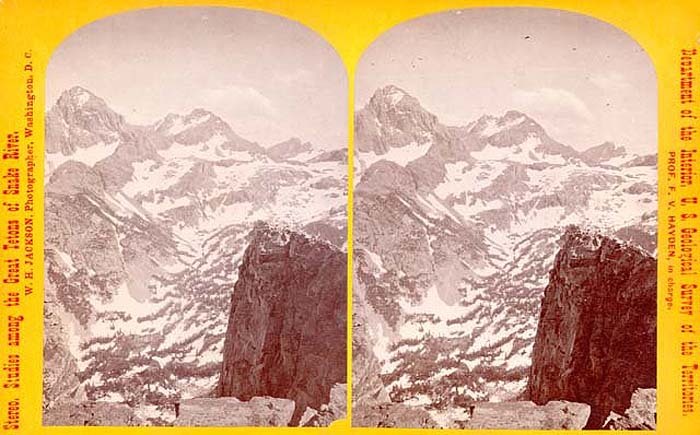 An Anthony image of the Tetons from Jackson’s "Views in the Rocky Mountains" series. 18.–Crater of the Grand Geyser. 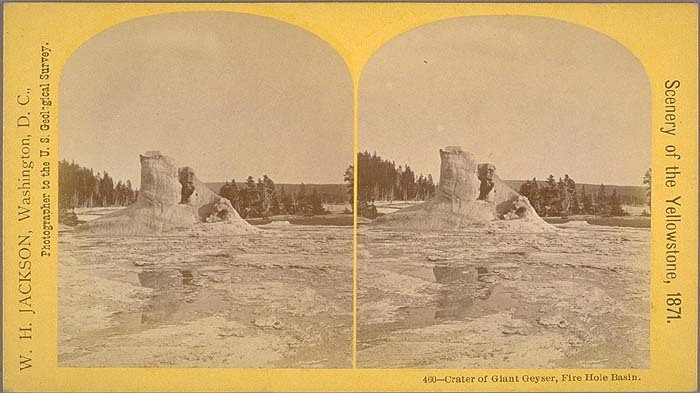 An Anthony orange mount showing Grand Geyser Crater at Upper Geyser Basin. 35.–Mammoth Hot Springs of Gardiner's River. Upper Basins. 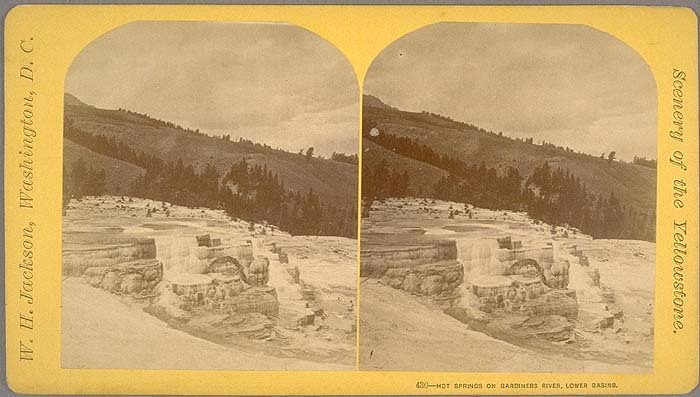 An Anthony red mount showing a terrace at Mammoth Hot Springs. 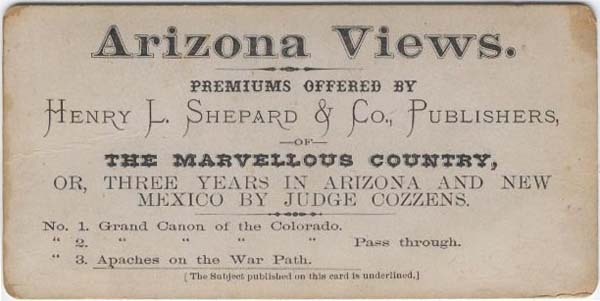 This view has a hand-written title on the reverse side. This verso shows up on many Anthony/Jackson orange and red mounts, as opposed to the more elaborate reverse of the yellow mounts above. Two examples of other major publishers who sold Anthony images with their own stamps over the Anthony credit. Dozens of these secondary publishers probably exist. 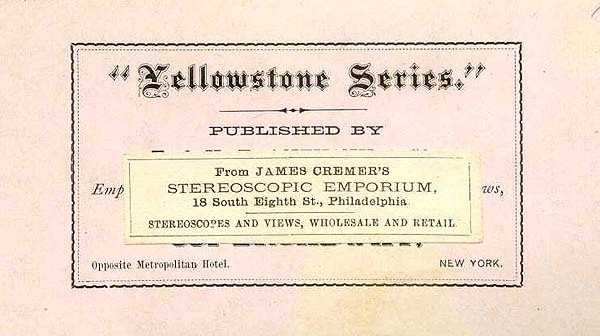 Jackson evidently made this scarce series that included Yellowstone views. I have only recorded three of them. 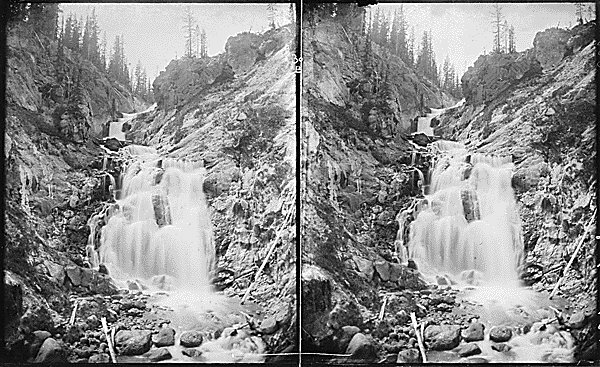 The title "Yellowstone Series" appears in the top center of each view. The words, "W.H. Jackson, Denver, Col." appear in the upper right corner. The words, "Photographed and Published by," appear in the upper left. 295. Old Faithful in Eruption. This odd series originally did not include views of Yellowstone at all. 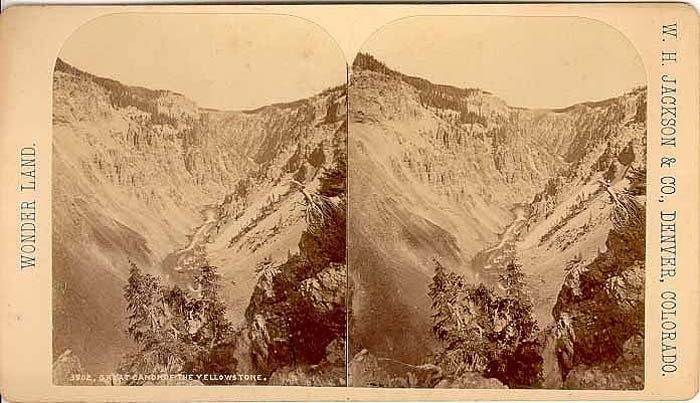 However with the later boundary changes to the park, this Montana Territory series now had views inside Yellowstone. 394. View on the Gallatin, near its source. This is the more common 3000 series style, its numbers range from 3901 to at least 3992. The left side is labeled, "414 Larimer Street, Denver, Colo." The right side is Labeled, "W. H. Jackson & Co., Photographers." These views are all on tan mounts. This is the rarer of the 3000 series styles. It is numbered from at least 3901-3915. The views are on cream-colored mounts. The left side is labeled, "WONDER LAND." The right side is labeled, "W. H. JACKSON & CO., DENVER COLORADO," in blue lettering. The titles have white lettering over the photo on the lower left side. 3902. GREAT CANON OF THE YELLOWSTONE. Two other Denver styles worth noting are these white mount views. One is a 3000 series view that is titled and numbered but has no publisher credit. The other is labeled, "Yellowstone National Park" on the left side, and "W.H. Jackson & Co., Denver Colo." on the right side. It has no title but shows a terrace at Mammoth. I don’t know if these were test runs, or part of larger non-Yellowstone sets. Jackson did have several labeling errors during his Denver production. I have turned up views labeled "Yellowstone Series, that are not in Yellowstone at all. One of note is entitled: "Upper Falls, Rock Creek." This is particularly interesting because Yellowstone does have a Rock Creek, but this same photo shows in another series as being in the Elk Mountains of Colorado. 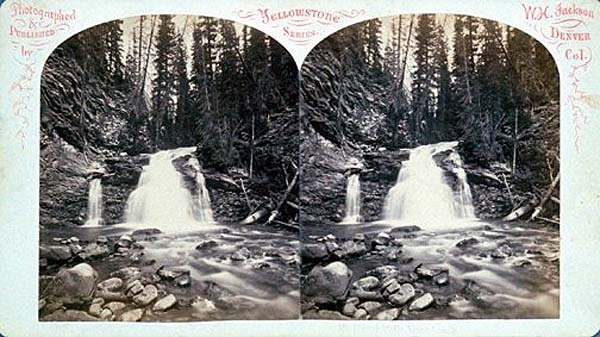 Therefore it is worth noting that not all Jackson stereoviews labeled "Yellowstone," are accurate. 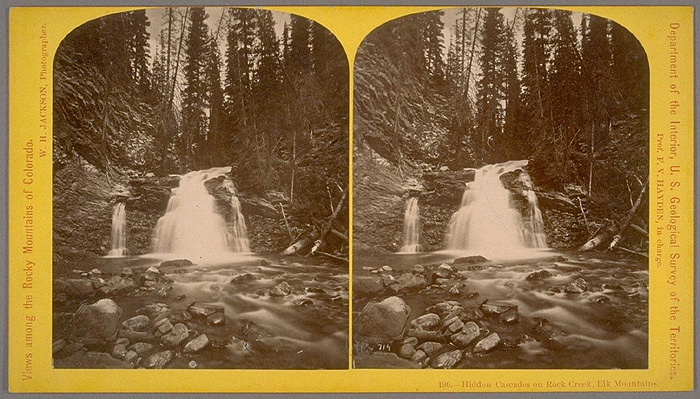 190.-Hidden Cascades on Rock Creek, Elk Mountains. 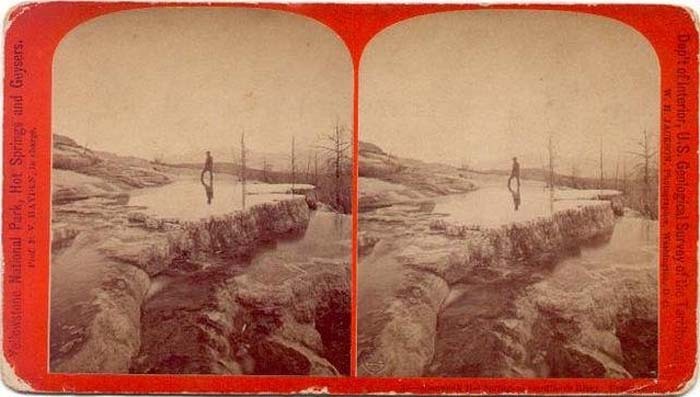 The National Archives in Washington D. C. houses many unpublished Jackson Yellowstone stereoviews. Below are three examples.